The Gay Writers Guild Summer 2002 Award for Best Humanitarian Website Many circumcised men are restoring their foreskins. This practice has been happening since Moses came down from the mountain with the concept of genital mutilation. Some of those who are restoring are also keeping online diaries. This award celebrates those online diaries that are "of quality". Mine is here. I would like to show my appreciation and admiration for your work with the following award. It would be an honor if you would display the attached award on your site to display recognition from my site to your readers. Thank You for your hard work and for some of the best reading on the net!!! My Story, Chris and Nigel, has won an award! Nigel, the beautiful silver blond haired, blue eyed teenager was voted Best Characterisation for 1999. I am so proud. 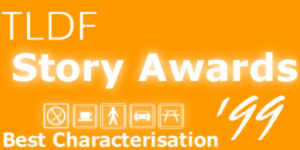 Click the award to visit The Long Dark Foundation. Awarded December 2001. The Stonewall Society. Pride Equals Equality. Join it and make even a small difference. Wow. The Lizard Tales Award. For November 1999. Am I proud? Too right I am proud. This seems to be an amazing time of year. 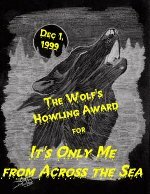 An award from The Wolf. WOW! Another award. It's gong to get to the stage when I need to design one of my own to give out! Ashley is a wonderful friend. An awesome young man, too. And, for my sins, I misplaced his award. But I have rectified that. A "GayDays Award" is to be proud of. Awarded 27 March 2001 The Gay Writers Guild Awards Committee has awarded this to Chris and Nigel, Book 2, Chapter 12 which you will find by clicking this link I'm deeply honoured. I've hoped for a Gay Page award for ages. And now I have a "Pic of the Week" award, too. I feel somewhat humble. I think, hope, it is because of the resources sections on the site. Gay Page Awards also decided to award me the MONTH award. Oh wow! June 2001 - Wow! The Season Award for Spring! The Gay Page Awards have changed. The "new" site vanished, the old awarding site died, and the "newest" site seems to be a commercial operation and some sort of nascent "Gay Portal". So I am leaving the old, orginal awards that I was proud of, and deciding if I want anything to do with the new scheme. I have withdrawn from the Gay Page Awards webring because I no longer feel able to support it. New "rules" have come into being by stealth, and the first communication from the ringmaster I classed as Spam, since it exhorted me to pay money for a banner exchange programme.